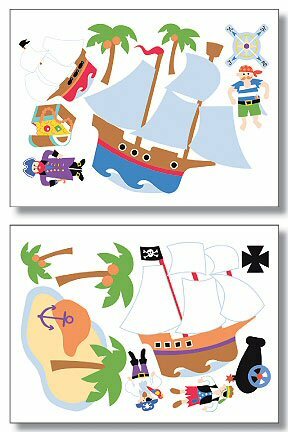 Transform your child's room into a high seas adventure with these creative Olive Kids Pirates Wallies Big Mural Wallpaper Cutouts. 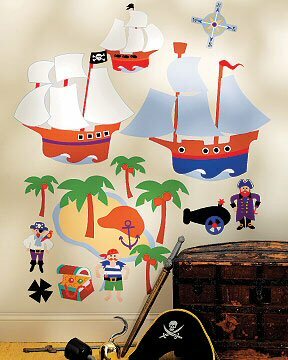 Each piece is diecut for easy use, and with one ship alone over 2 feet tall, this pirates mural set is a fun, fast, and easy way to transform a room on a budget. Making it easy to achieve the look of stenciling, these fun Olive Kids Pirates Wallies Big Mural Wallpaper Cutouts will delight the swashbuckler in your life. Ships 11.75" x 12.5" to 27.75" x 25.5"; Palm Trees 6.5" x 7.5" to 10" x 12"; Compass 8.5" x 8.5"; Island 21" x 15.25"; Chest 6.5" x 7.5"; Cross 4" x 4"; Cannon 8.5" x 6.75"; Pirates 5.75" x 9.25" to 6.5" x 9.75"
Create a pirate's paradise in your child's room with this fun Treasure Hunt peel and stick border.